“From the day she could talk, Lizzie loved to tell stories. Tall ones. True ones. It’s been two years since my breakfast interview with author/illustrator Tricia Tusa, whose work I love so very much. 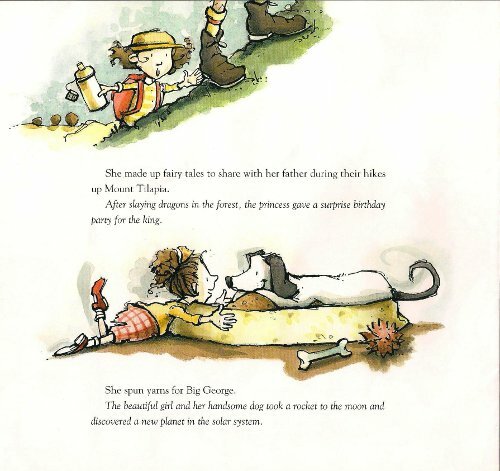 She’s got a new illustrated title out, Once Upon a Baby Brother (Farrar, Straus and Giroux, June 2010), written by Sarah Sullivan, so I thought I’d share some spreads from it today. There is far from a dearth of picture book titles about new baby siblings in the family, but this one stands out. Lizzie, as you can see above, loves to tell stories. Then, her little brother, Marvin, comes along, and no one in the family’s got time to hear her tales anymore. She excels in school, however, what with her story-loving teacher, Miss Pennyroyal. Excels, that is, until Marvin goes to visit Gramma and “something was missing.” She even runs out of story ideas. When Marvin returns, wrecking his usual havoc, she’s inspired to create her own comic book character out of him, which means, yes, we get to see Tricia try her hand at some comics-within-a-story, those moments of the book rather reminiscent of Mini Grey. Here’s another spread from it. Enjoy Tricia’s bright watercolors. You can click all of these to supersize them and see them in more detail. Note: I see that Tricia also illustrated this title from Hyperion in 2010, which I have yet to see. Perhaps other Tusa fans can weigh in? ONCE UPON A BABY BROTHER © 2010 by Sarah Sullivan. Illustrations © 2010 by Tricia Tusa. Published by Farrar, Straus and Giroux, New York, NY. Thanks for showing off a few spreads of Tricia’s book. Her art is glowing with energy like usual. I checked out the Sandwich Swap from my library and loved it. Tricia puts so much personality into her characters! I read The Sandwich Swap (your linked book) and loved it. The story was well told about being open to other cultures and ways of doing things – in this case eating peanut butter sandwiches vs hummus and pitas for lunch. But for me, being an illustrator, it was the illustrations that really made the book. Tricia’s characters display so much innocent personality and indignation at the thought of their own lunch being called weird. Definitely a good book to check out. It’s on my wish list to buy. My own (adult) writing has a very quiet interior, and so often the children’s books I see reviewed on websites seem over-determined or loud and pandering. But this little book clearly has soul. LOVE that opening spread of The Storyteller in the Crib! 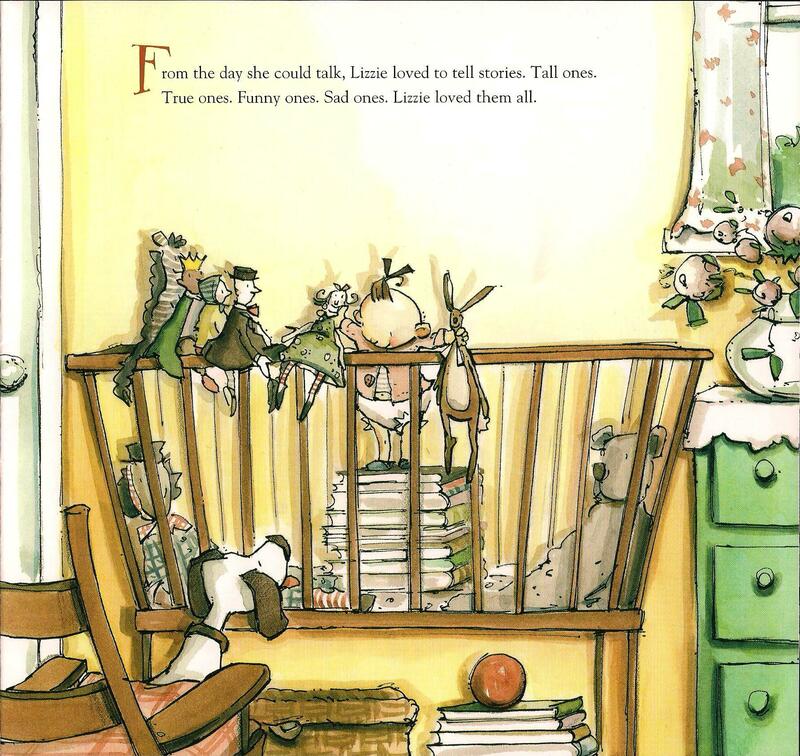 The audience of stuffed toys lined up on the rail… The stack of books as a toddler podium… the attentive doggy… just great. My students always enjoy reading books by Ms. Tusa and her distinctive illustrative style. I love “Mount Tilapia”! What a great name! Tusa has caught the essence of Sullivan’s writing — sweet, with an edge. Sullivan doesn’t write “down” to the audience and Tusa’s art is appealing to the reader (the parent) and the listener/viewer (the child). Oh, I do love Tricia Tusa! This sounds adorable for my little girl, who is dealing with her own new little brother. I just love Tricia’s illustrations!! Hi, Can you email me an address (email or physical) for Tricia Tusa? Please?